A huge problem of report cards is that they are summative–they only provide a static snapshot of student learning at the end of a grading period. But my questions focus on the process of learning: What is my child doing right now? What are her learning goals? How is she progressing? Does she like school and what she is studying? 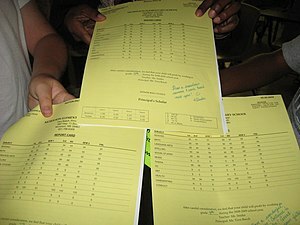 Why do we still assess students this way, through a summative report card? I think mainly because “that’s the way we do it” and it’s easy for the teacher and school. Just a slip of paper with grades that parents can brag about (or not!) and impersonal comments. So you are probably asking–what is my solution? Well, it’s not an easy one, because it would involve a paradigm shift of how we do things in school. Instead of grade reports, we should be able to view and assess throughout the school year–through the PROGRESS our students are making. Instead of thinking of final grades and that students have “learned” something, why not look at a more important aspect of student learning–development or progress? How might we do this? In this classroom, each student has a laptop and can login to the school’s wireless network. Students have access to Google docs and other web-based tools for reading, writing, collaborating, and publishing. Students create their own blog for the class, where they post just about all of their writing. Because blogs are great ways to share, receive feedback, and publish, with posts appearing in reverse chronological order, student progress in writing could be easily viewed throughout the academic year. Teachers, other students, AND YES–parents, could read and post comments to individual posts. Teachers could set goals for students to reach, such as number of posts written, creativity of post and writing, number of posts with positive comments, posts that include multimedia, etc. This is just a brief example, but could be translated to other content areas as well. By providing students with individualized learning goals and paths, including technology to monitor and share progress, and creating a digital repository and record of achievements, students could demonstrate proficiency and learning at their own levels, making learning fun, engaging, and meaningful. What do you think? Is your school doing any sort of online portfolios to assess students? How would you tackle “blowing up the gradebook?” Do you agree or disagree? I’d like to hear from you.